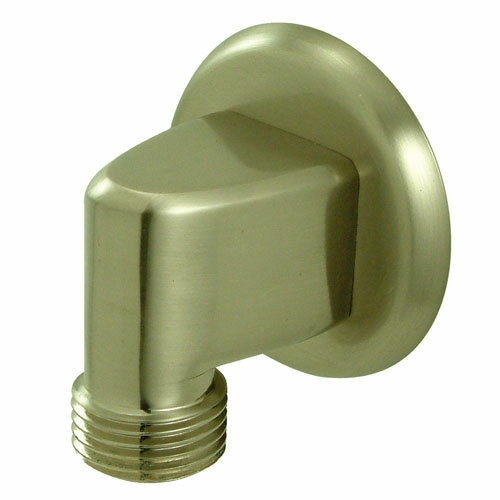 Kingston Brass Bathroom Accessories Satin Nickel Brass Supply Elbow K173A8: This Brass Supply Elbow is built to last. The highest quality standards are used to precision manufacturer a top of the line product. Important features of this BRAND NEW Fixture: Complete Item! Everything necessary for installation is included. Matching Accessories Available - Easy to Install - Installation instructions included - Brass Supply Elbow - The brass supply elbow consists of a 2-inch diameter flange used as a wall mount to enable efficient transference of water flowing to the hose (A necessity with the elbow). - Constructed from solid brass for durability and reliability - Made of satin nickel for that shiny silvery look - With 2-inch diameter flange - Standard 1/2-inch connection - Designed for a lifetime of exceptional performance - Satin Nickel premier finish designed to resist fading and tarnishing. This fixture is manufactured by Kingston Brass and is part of their Plumbing Parts collection.